sweet pleasure : plaisir sucré: mmm meyer lemons! 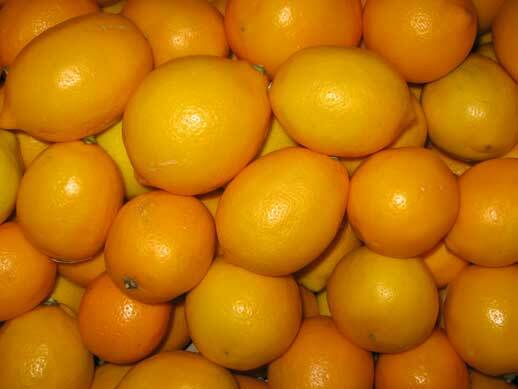 Meyer lemons are named after US plant explorer Frank Meyer, who found them in Beijing, China. In 1908, Meyer lemons were introduced to North America and became popular in California, Florida and Texas. The Meyer lemon is a hybrid between Citrus limon, the lemon, and Citrus reticulata, the mandarin orange. The appearance of the Meyer lemon is: thin smooth unpitted skin; deep yellow to orange colour when mature; very juicy yellow-orange flesh; rounder and more tender than the standard lemon. The characteristics of the Meyer lemon are: tangy aroma/fragrance; slightly sweet peel; juicier, sweeter, and less acidic and tart than the standard lemon. The Meyer lemon plant bears fruit from November through April but are hard to find in grocery stores as they are very popular with restaurants and chefs within the regions their grown. Meyer lemons are wonderful for cooking and baking because their flavour and mellowness blends well with herbs, spices and other flavours and makes them versatile and appealing. I was shopping at Whole Foods the other day when I came across a heap of glowing Meyer lemons. I haven't come across Meyer lemons that often and knew that I would be making dessert for a dinner this weekend; so, I decided to buy a bunch. When I got home, I went to my pastry books and took out Chez Panisse Desserts by Lindsey Shere and Chez Panisse Fruit by Alice Waters. As Alice Waters notes on the Meyer lemon, “it wasn’t until our long time pastry chef Lindsey Shere started experimenting with them that our proselytization began.” Shere has been inspiring chefs and home cooks for years with her wonderful knowledge and her insistence on quality and seasonal ingredients. Armed with inspiration, a recipe and Meyer lemons, I set out to make a lemon dessert. 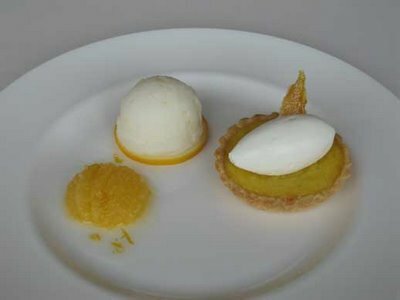 I wanted to make a dessert which really emphasized the flavour and aroma of the Meyer lemon. So I knew it had to be simple and clean. I decided to make a lemon tart with a sherbet and a compote. The crust of the lemon tart was tender and flakey. The filling was tangy without being tart and the quenelle of cream helped to further soften the acidity. The candied citrus peel added a nice crisp sweetness. The sherbet was light and lively without being too acidic. The addition of milk in the sherbet recipe helped to mellow it. Lastly, the compote of segmented lemon with lemon sauce helped to give the taster a clear understanding of the taste, texture and tanginess of the Meyer lemon. Grate the peel from the lemons into a small non-corroding bowl. Juice the lemons and strain the juice into the same bowl. Strain out seeds, but force as much as the pulp through the strainer. Beat the eggs and egg yolks with the sugar in a heavy non-corroding saucepan just until mixed. Gradually mix the milk into the cornstarch in a small cup, then add them to the egg mixture – the cornstarch is necessary if the filling is to brown properly when baking. If you do not want to brown the tart, the cornstarch can be omitted. Next stir in the juice mixture: it will look a bit curdled when the juice is added, but will smooth out later. Cut the butter into pieces and add to the mixture. Cook the mixture over low to medium heat, stirring constantly, until it just coats the spoon and is the thickness of crème anglaise. Let it stand 5 minutes to thicken, then whisk slightly to smooth it. At this point you can pour the filling into a container and keep it in the refrigerator for up to two weeks. In any case it is best to chill the filling before making a tart, but you may also pour it into the pre-baked tart shell without chilling it. Preheat your oven to 375ºF. Fill the slightly cooled pre-baked shell with filling and bake for 30-35 minutes, or until the top is speckled with dark brown spots and the filling has puffed slightly. Remove from the oven and cool on a rack in its pan. You can also bake the tart just long enough to set the filling, about 15-20 minutes. This will make a smooth, shiny tart. In a small saucepan, gently heat the sugar and water until the sugar is dissolved. Pour this syrup into a bowl with the lemon juice. Stir in the zest and milk. In the saucepan, combine the gelatin with the water and let it sit for 5 minutes. Once the gelatin has plumped up, heat it gently until there is no visible graininess. Add the melted gelatin to the lemon mixture and refrigerate. When the sherbet base is cold, freeze it according to the instructions for your ice cream maker. If you haven’t had Meyer lemons before, pick some up and give them a try. I recommend anything that any one of the Chez Panisse cookbooks suggest with Meyer lemons. I absolutely adore them and I can see why they are popular and often in limited supply. I hope you enjoy! Posted by Sam at 5:04 p.m. Ever since you mentioned Meyer lemons in a comment on my blog, I knew I'd find something lemony and spectacular on yours one of these days! And, indeed, I did! This dessert look incredible. Are you in the food industry? You must be! I've never seen a home cook prepare desserts such as yours (I'm thinking back to your panna cottas here). Wonderful! Thank you for your comment and visiting! Thanks for your comment about the dessert. I went to pastry school and I did have a brief encounter in the food industry. My occupation sadly doesn't involve eating or testing out recipes! The reason why I started this blog was to learn, explore, create, share and challenge myself. I'm pretty much a kid at heart who loves dessert. First of all, thank you for the information about the origin of the Meyer lemon. While I'd heard of the lemon, I knew very little about it. Secondly, as soon as spring arrives my heart just sings "lemon" and this tart looks and sounds so beautiful. Finally, thanks for inadvertently giving me the kick in the pants I needed regarding Lindsay Shere and Alice Watters. I have both those books but have never used them. You have inspired me! I love visiting this blog and have added you to my blog links because you're fantastic and everyone needs to come and see the great things that you're doing! I just discovered your blog through Ivonne's and MY, what desserts you hav e there! Wonderful! I shall return to learn tons of things! Love Meyer lemons and this tart looks, well, "superbe"! I love lemon tarts and must give it a try! I've had trouble finding Meyer lemons in Toronto too. FYI, I've also found them at the organic greengrocer in the St. Lawrence Market and at Harvest Wagon. I've also added you to my blogroll. Thanks for your lovely comment. I definately recommend getting your hands on some Meyer lemons, they are fantastic. Thanks for adding me to your links, I think your the first. Sam does a mini happy dance! Thanks for visiting! I love Meyer lemons too. Thanks for visiting, the Meyer lemon info in TO and the addition into your blogroll. Another mini happy dance. I added your blog to mine as well! Thanks for your comment. I've add you to my blog roll. I live in Southern California where my neighbors THROW THEIR MEYER LEMONS IN THE TRASH!!! I thank you for your recipes as I am always searching for more ways to use up all our Meyers (and Eurekas, and grapefruits, and Key Limes). Check out http://www.tigersandstrawberries.com/2006/03/11/meyer-lemon-and-ginger-pie/ for another saga of Meyer lemons. I gasped in horror when I read, "my neighbors THROW THEIR MEYER LEMONS IN THE TRASH!!!". They could juice them and freeze it, make lemonade , give them away to friends or better yet send them to me! Thanks for your comments Michele! Sam, if you check out the exchange on Tigers and Strawberries blog, you'll see that's exactly what I've done -- I mailed her 2 boxes of mixed lemons and grapefruits just because I loved reading her blog so much and my lemons deserve to be cooked up! (She paid to ship the first box, then I sent her a second because one or two in the first got mushed). I would be more than happy to do the same for you, but as we found out UPS is not cheap, even by ground. That said, she got over 20 lbs. of organic citrus straight of the trees... Unfortunately, alot of the neighborhood trees have already been stripped (supposedly the fallen fruit attracts desert rats) and recycled, but I still have Meyers and grapefruit. If you want to check the shipping costs for pick up from S.Calif. (zip 92211) I am happy to enrich your kitchen as well, considering I already have my eye on a couple of your recipes. My price: you promise to post more lemon recipes! p.s. Have you tried the recipe for Lemon French Toast from Lemon Zest yet? Thank you sooo much for your fantastic offer. You are really sweet. Unfortunately citrus can not be taken or mailed across the border. If I do come across more Meyer lemons, I will buy some and make a dessert especially for you! I haven't tried the lemon french toast, but I will definitely look into that, thanks again. Hi Sam, your site is beautiful - are you a professional pastry chef? All of your creations look wonderful! I've been dreaming about meyer lemons which we can't get here, I'd like to try them one day. Keep up the good work.